I will be listing a large quantity of toys over the next few weeks. Check out my other auctions for many more 1950's - 1960's Japan boxed battery operated, wind-up, and friction toys. 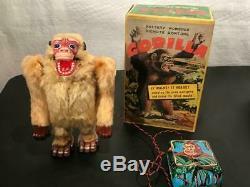 Neat 1950's - 1960's Japan tin battery operated Gorilla toy with original box. This toy is made of tin and plush and he has a nice tin litho face. The battery box is all lithographed tin with a wonderful raised embossed image of the bust of the gorilla surrounded with jungle trees and vines! The battery box is very clean. There is an on/off switch for this toy, and when you turn it on the gorilla walks forward swings it's arms slightly, while he opens and closes his mouth, his eyes light up, and he roars! All functions still work great except for his arms just move very slightly to and fro when they should have bigger moevements up above. The litho is still super clean and glossy with almost no wear. It comes in the original box that has awesome graphics of the gorilla in the wild with rays coming out of his eyes and mouth! CONDITION: The toy is in glossy condition with very little wear, and all functions still work except the arm movement is limited as mentioned above. The box top is very solid with some edge wear and one split corner, and there is some white paint residue on the top end of the box. The box bottom is fairly solid as shown. Get Supersized Images & Free Image Hosting. Attention Sellers - Get Templates Image Hosting, Scheduling at Auctiva. Nomura Japan Tin Battery Operated Toy Gorilla in Original Box (King Kong)" is in sale since Wednesday, April 3, 2019. This item is in the category "Toys & Hobbies\Robots, Monsters & Space Toys\Monsters\Other Monster Toys". The seller is "treasuresof-yesterday" and is located in Webster, New York.